This weekend is the annual Port Aransas Whooping Crane Festival! There will be guided tours of the Port Aransas birding suites, boat rides out to Aransas Wildlife Refuge to see the cranes in question, talks about conservation. All sorts of good things, for the bird nerd in you. How about a couple of brief birding stories, to gear up? I don’t have any long, drawn out adventures the way some birders accumulate. But, the Texas Coastal Bend has some of the best birding in the nation and I’ve seen some cool things. Imagine a whole field of these guys. Image from Cornell's All About Birds, because I'm not that good a photographer. The best birding sometimes occurs during the worst weather. Right smack dab of the spring migration in April 2013, a cold front hit Port A. All the birds heading north for the summer hunkered down in Port Aransas for a few days, to wait out the weather. We were treated to some truly spectacular birds. The best part: the cold front made them stop, but the weather cleared it up almost immediately. We strolled around town, peeked out our office windows, and watched with glee as Painted Buntings, Black-and-White-Warblers, Blue Grosbeaks, and all manner of pretty little birds rested for a couple days. I was (and still am) a novice birder, and had never seen a fallout like this. Karen, another MSI grad student, and I decided to walk to happy hour that Friday, from work. Normally, we would get there in about five minutes, but I think we took half an hour there were so many cool birds. An empty lot filled with Indigo Buntings. A small flock of White Ibis. Baltimore Orioles flitting back and forth. About halfway along our walk, we came to a tree that was chock full of birds. Mostly warblers that I couldn’t get a good look at, orioles, and then a very distinctive little bird that I’d never seen before. Small, black, but with bright orange wing and tail bars. We stared at it, racking our brains. Neither Karen or I were particularly well-studied birders – we just thought they were cool. American Redstart, from the Houston Audobon. Luckily, we live in Port Aransas, where every third person is obsessed with birds. We continued on to happy hour, ogling other birds as we went. Shortly thereafter, we described the unidentified bird to a visiting professor, who promptly named it: American Redstart. Any birders out there probably guessed that immediately, but new to us at the time! Anyway, that’s the biggest fallout we’ve had here in Port A since I moved down here, but we see lots of cool birds at other times. I’ll be going out on one of the guided boat tours to see the Whooping Cranes. I have seen them before, but always from a distance. In 2011, myself and a postdoc (who is much birdier than I!) traveled up to Inuvik, CA to sample the Mackenzie River. We saw lots of very cool birds while there – a gyrfalcon, grebes, bald eagles, lots of ducks, sandhill cranes. On bright clear evenings, which were wonderfully frequent, we would sit on the porch of the house we stayed in, drinking beer, talking science and hanging out with the few other scientists stationed in Inuvik. This particular evening, it was just us, flipping through Jorien’s bird book to figure out what we’d seen today. A long shadow passed over, we looked up, and saw huge crane-like birds overhead. Whooping cranes had been officially sighted in Inuvik a couple years before. These seemed too big, and a very bright white, to be sandhill cranes. Most likely, that’s what they were. These days, though, I like to think they were whoopers, though. Sandhill cranes at the Aransas Wildlife Refuge. There aren’t that many memorable papers. I mean, there are thousands of decent or even good papers published every week. But they all sort of blend together after a while. I have a hard time keeping them straight sometimes. Just today, I told my advisor the wrong thing about a paper I included in a literature review I’m writing. It was not a good paper, and I had confused the methods from the not-so-great paper with those of a much better paper. My point is that most papers are forgettable to an extent. Occasionally, however, you’ll read something that’s like a bolt through the sky. You’ll sit up and say, “I want to do THAT.” This week, that paper presented data from ice wedges in Siberia, then reconstructed winter temperatures. Esoteric, yes. But also really cool. First, what are ice wedges? As much as a quarter of land in the northern hemisphere is underlain by permafrost, ground that is below freezing temperatures for two or more years in a row. During winter, the extreme cold temperatures cause the ground itself to contract, forming fissures and cracks. Once temperatures rise in spring, snowmelt fills those cracks. The water re-freezes – after all, the soils around it are well below freezing! Freezing actually causes water to expand, and the new ice wedge widens the gap slightly, and pushing surrounding frozen soils upwards. Think a tube of toothpaste – you squeeze the sides together, and the toothpaste comes out the top. The following winter, the permafrost contracts again, opening a crack in the ice and starting the process over again. See the little diagram I made to get a better idea. These can get massive, and very, very old. Meyer et al. (2015) just published a paper taking advantage of the age and sequential way ice wedges are formed. They went to the Lena River delta (right), one of the largest deltas in the world. Permafrost abounds, and previous work established the age of different parts of the delta fairly well. Ice wedges are also common. Figure S2 from Meyer et al. (2015). Yeah, science! And chain saws. When we sampled ice wedges on the Kolyma River, we used an axe. Anyway, they cut out sections of the wedges, melted them and preserved the water. Later, they ran isotopic analyses which told them a) the approximate age of the water using radiocarbon and b) the relative temperature using oxygen isotopes. I’ll spare you the details of how the isotopes work – don’t worry, I’ll go into excruciating detail on that some other time. For now, just know that higher oxygen isotopes mean warmer temperatures. Using this, Meyer and his colleagues re-constructed 8,000 years of winter-spring temperatures. The winter-spring temperature reconstructions are almost unique in high-latitudes. Most of our long-term temperature proxies – tree rings, for instance – are based on annual growing seasons. Great, we need to know this. But much of the recent anthropogenic climate warming in the Arctic has been during winter and spring. We need to know – is this different than in previous natural climate changes? What impact will winter warming have on carbon sequestration in permafrost? How will winter warming impact hydrology, weather, the length of the growing season? These reconstructions are a first stab at answering those types of questions. The reconstructed climate from ice wedges reveals winter warming, opposite of other summer-biased climate records. Again, I won’t delve too deeply into these mechanisms right now, but this was likely driven by changes in orbital forcing. The shape of Earth’s orbit changes through time, on cycles of ~20,000 – 100,000 years. These changes impact how much energy we receive from the sun, and its distribution. Meyer and colleagues used models of past climate to show that winter warming was likely driven by these changes in our orbit around the sun. At the same time, there was a significant increase in carbon dioxide concentrations during the 8,000 year record. Reconciling this increase in greenhouse gases with a cooling in summer temperatures is accomplished by including these warming winter temperatures. Figure 1F from Meyer et al. 2015. The take-away: winter temperatures have a long-term warming trend, that has jumped up dramatically in the past 50 - 100 years. Alaskan ice wedges received similar analyses a couple years ago, but we have much less data of any sort from Russia compared to the North American Arctic. I originally got involved in Arctic research as an undergraduate on a project aiming to correct this. We went to the Kolyma River in northeast Siberia, and conducted all sorts of research on carbon cycling (see www.thepolarisproject.org). I returned in 2013, and would love to go back again. I work mostly on modern carbon cycling, these days. But I’ve always found paleoclimate fascinating – reading about ancient climate and cultures launched me towards my present career when I was a sophomore in high school. I want to do paleoclimate, and I want to get back to northeast Siberia. The Kolyma River is home to a great science station, lots of good researchers spend their summers there. And guess what else it has? I can’t remember who told me this, but it’s emblematic of the responses I get when I tell people I’m a biogeochemist. So, what do I actually do? 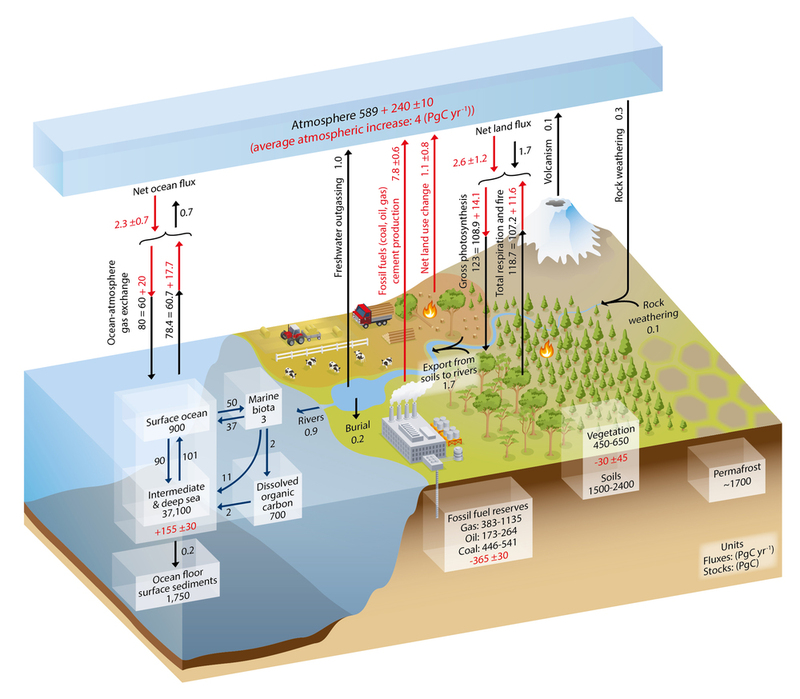 What is biogeochemistry? Biogeochemists study how elements cycle through different parts of the Earth system. Carbon, nitrogen, oxygen, and many other elements are essential for life. Of course, they aren’t just important because of how they’re used by life forms, but also what role they might play in the physical-chemical environment. Carbon, for instance, can be energy for organisms as part of a sugar molecule; a greenhouse gas when in the atmosphere as carbon dioxide; it influences the acidity of waters when dissolved at bicarbonate; or might be stored away for eons as calcium carbonate in limestone rocks. We study how that one element moves through different systems, and interacts with the biology, chemistry and physics of its environment. We do the same for other elements – nitrogen, calcium, oxygen, iron, and plenty of others. As you might guess from my example, I mostly am interested in carbon. It’s in the food we eat, and the air we breathe. It’s in our water, it’s the energy source for most of our electricity, and the structure for many of the rocks we stand on. It’s important. Humans are also changing where carbon is found. Hundreds of millions of years ago, during the Carboniferous Period (get it? ), wetlands and lowland swamp forests covered vast regions of the continents. Temperatures were warm, oxygen was high, and life was big: this was the age of giant dragonflies and towering tree ferns. The carbon that formed the tree ferns and other plants in these swamps was eventually buried and preserved in sediments. Add time, heat, and pressure – the result is coal. Coal is largely 300 million year old dead plants. And, as you know, we’re burning that coal. Other fossil fuels – methane/natural gas and oil – have similar histories. Stored away for millions and millions of year, now combusted and turned into CO2. For now, I won’t get into the science of climate change beyond this: it’s real. It’s not a hoax. And humans are driving it. The really interesting bit, to me, is that these fossil fuels are not the only potential sources of carbon to the atmosphere. Look at the tropics – how much carbon do you think is stored in the Amazon forests? And how much of that is released when you slash-and-burn it, or during a drought? How much carbon do you think is released when the Indonesian rainforests are replaced by palm oil plantations? Hint: it’s a lot. Yedoma soils in NE Siberia, with ~30,000 year old plant roots exposed. Photo courtesy of Chris Linder. Or, go to the poles. Look at the soils. That soil has been frozen for thousands, tens of thousands of years. Since the last ice age, in some cases. Some places, you can look at the soil and see roots and plants that have been preserved for 30,000 years. Many of those soils are peats, sphagnum moss piling on top of each other and compressing and degrading for thousands of years. Maybe you’ve heard of how in Ireland or Scotland, people would burn peat to heat their homes when firewood or coal was scarce. It’s the same idea – compress peat for a few million years, and you’d end up with something very like coal. In fact, the UN classifies peat as a fossil fuel. Frozen northern soils – permafrost – hold about twice as much carbon as is currently in the atmosphere. Thaw those soils, free them up so that the plants and moss and roots and all the little bits of organic matter can start to rot, and what starts to happen? Where does all that carbon go? And I’ll let you know how I’m trying to answer part of that next time! When I want to procrastinate, which is all too often, one of my top strategies is to engage in “career development.” Looking for jobs that I might be qualified for, poking around www.sciencecareers.org or the Earth Science Women’s Network (www.eswnonline.org), or reading columns on Inside Higher Ed or the Chronicle. And the blogs. Oh, the blogs. So many. Write more. Write every day. Every single day. Treat it like a meeting – have at least a half hour of your day blocked out to write. Just get in the habit. Practice, practice, practice. Don’t get distracted. Turn off your internet. And WRITE. I know this. I’ve known this for years. A couple of years ago, I went on a kick of consuming a bunch of books about writing. I read everything from Anne Lammott’s Bird by Bird to Josh Schimel’s Writing Science. Stephen King’s On Writing and William Zinsser’s Writing Well. Strunk and White. Science Writing and Communication. And guess what they said you should do? When I was 17, I tried to do National Novel Writing Month (NaNoWriMo, for those in the know). Hundreds of thousands of people participating, trying to pound out 50,000 words in the month of November. That’s 1,667 words a day. Up through this sentence, this post is 240. I made it about half way through my novel, then stopped for a couple days and could never pick it up again. I still argue that November is a terrible month for this – how does anyone write during the chaos that is Thanksgiving? Nonetheless, every few years I try again. But I have never been as disciplined about it as that first time. Sure, I can pound out that much pretty easily on any given day, but not day in and day out. Establishing that habit, that pattern, is key. I learned that in high school through my failed novel, and it still holds true. Writing science is different, of course. Getting a paper done is not so much about hitting a word count every day, as it is about finishing an idea or section. That might be the entire methods section (which I did a VERY rough version of yesterday for one paper) or it might be just a short paragraph in your discussion. Or the carefully phrased research questions in a proposal. Or the abstract as the cake topper to your (mostly) finished work. The point is, though, to get through something. So, that’s my goal for 2015. Not to write a novel. Not to get ~1500 words a day. But just to write. Every day. At least half an hour. For now, it can be anything – a blog post even! But, especially as I really get down to writing that pesky dissertation, more and more of it will be science. Welcome to Birds, Books, and Biogeochemistry! I'll be using this space to talk about, well, birds, books, and biogeochemistry. Expect stories from the Arctic, tales from Texas, and thoughts about whatever I have read most recently. A little about me: I'm a Ph.D. student at the University of Texas at Austin, only I don't live in Austin. I'm at the Marine Science Institute, about 200 miles away, in Port Aransas, TX. The South Texas Riviera. No, really, sometimes it's called that. I work primarily in the Arctic on river chemistry. There will probably be lots of talk about Arctic climate change in this. I'm in the last year (hopefully) of my graduate work, and I figure writing regularly - of any sort - will be good practice as I gear up towards writing that dissertation. My friends, back in high school, accused me of being an old lady at 16. This was all too correct. I like to cook, and read. I have a cat. I drink copious amounts of tea. I go birding. I knit and crochet. I want a rocking chair for my porch, to sit in the sun and drink mint juleps. Mint that I grew, because I like gardening. I don't understand Snapchat. On the other hand, I'll go on a road trip at the drop of a hat. I love traveling, be it to northeast Russia or just to get a couple hours away from Port A. One of my life-goals is to spend at least a month in the Arctic of each arctic country - USA (check; Alaska), Canada (check; NWT); Russia (check; NE Siberia), Finland, Norway, Sweden, and Denmark/Greenland. Iceland would be great, too, although it's below the Arctic Circle. Well, I believe that's enough directionless ramblings about myself. Next post, whenever I get to it, will be more substantive!